Explaining to people that Royal Enfield motorcycles are "British" motorcycles, built in India, is tough enough. 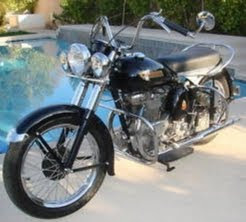 Explaining that Royal Enfield motorcycles made in Britain were sold as "Indian" motorcycles in the United States from 1955 to 1960 adds another layer of confusion. Those 1950s Indian-badged Royal Enfields included practically every model the British company made, including the fast vertical twins. These seemed perfect for American conditions and appropriate, too, because, before it ended its own production, Indian had been building vertical twin motorcycles. One of those "real" Indian twins just sold on eBay, in Ahwahnee, Calif. lovingly restored, for $11,975. "The 1949-1952 Indian Scout/Warrior series is the only parallel twin ever manufactured on American soil. These overhead valve motorcycles were built by Indian in Springfield, Massachusetts, in an effort to compete with the British offerings of the day. Do not confuse these motorcycles with the re-badged Royal Enfield motorcycles that were imported in the late 1950s." In Classic Bikes, Peter Henshaw explains that, unfortunately, the British-style Indians "weren't as tough as even a BSA or Triumph," and their failure effectively ended Indian as a manufacturer. 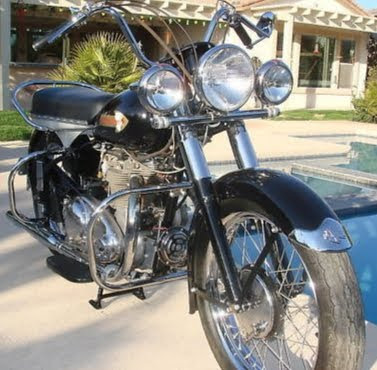 The eBay seller noted that his 1950 Warrior had been restored at no expense, including upgrades that overcame "the notoriously poor magneto problems Indian verticals suffered." It is a fascinating, if confusing, period in motorcycle history.